Most often we define ourselves by what we believe, but equally, often we disassociate ourselves from what we do. We know that certain precepts are proper, like "don't harm other sentient beings". But then, we might go out for a steak dinner. We say we love someone, but then when our feelings are hurt, we behave in a less than loving way. What we actually have to do in life, is disassociate ourselves from our beliefs and realize that our "our actions are our only true belongings". 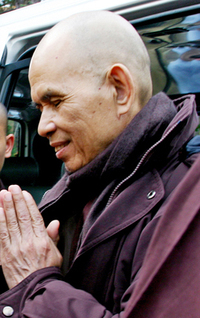 This is a teaching from Thich Nhat Hanh, and it is so very true. We have to realize that things like truth and love exist not because we believe in them, but because we bring them into existence through action. We must become "truth" and we must become "love" as opposed to being just believers in these things. An old joke about faith goes like this. Little Johnny is in church and the preacher says , "Johnny what is faith ? " . And Johnny says "Faith is believing in something you know ain't true". We each need to know what is true and false and about ourselves, and we do this by honestly evaluating the actions we take. When we actually "love" and actually are "truthful" we experience real freedom. Hello, this weekend is fastidious for me, as this time i am reading this fantastic educational article here at my house. Hi, I do believe this is a great site. I stummbledupon it ;) I am going to return once agin since i have book-marked it. Money and freedom is the greatest wway to change, may you be rich annd continue to guide other people. Wow that was unusual. I just wrote an vety long commnt but afger I clicked sujbmit my comment didn't show up. Grrrr... well I'm not writing alll that over again. Anyways, just wanted to say great blog! I visited several web pages but the audio quality for audio sonmgs present at this web page is truly fabulous. You're so cool! I don't think I've truly read something like that before. So wonderful to discover someone with a few unique thoughts on this subject. Seriously.. many thanks for starting this up. This website is one thing that is required on the web, someone with some originality! I am noww not positive the place you're getting your information, but good topic. I must spend some time learning much more or understanding more. Thanks for fantastic information I used to be looking for this information for my mission. It's going to be finish of mine day, however before ending I am reading this wonderful post to increase my know-how. After looking into a feew of the article on your web site, I trulyy like your technique of writing a blog. I book marked it to my bookmark website list and wil be checking back in the near future. Take a look at my web site too and tell me how youu feel.